Virgin Atlantic was looking around for new destinations in 2001 and focused on Lagos. It turned out to be a smart move, the route is now one of its best performing and in an era where Nigeria’s aviation sector is burgeoning and the opportunities presented by economic development in Sub-Saharan Africa overall are growing, it is well positioned to build on its first mover advantage. 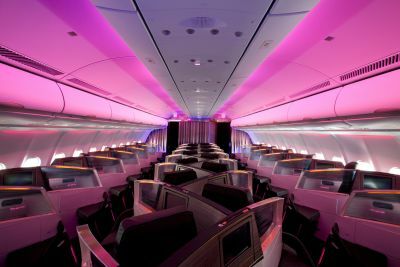 For travellers heading to Lagos Virgin Atlantic offers Economy, Premium Economy and Upper Class. In true Virgin style the journey starts way before you board the aircraft as the airline offers qualifying Upper Class passengers a complimentary chauffeur car service from your office or home as long as it is within 75 miles of your airport. For the spirited, and light of luggage, there’s also the option of a Limobike that can speed you through the centre of town to Terminal 3 at Heathrow from where the flights to Lagos depart. Once dropped off passengers enjoy the benefits of a dedicated area for check-in. Upper Class passengers are swiftly served and directed to a private elevator taking you to a private security channel. Handled by a Heathrow security team that solely look after Virgin passengers the sigh-inducing waits while belts, shoes and computers are removed, are dissipated with no queues to hold you up. Within five minutes from arrival passengers are in the heart of the departure lounge. Regular flyers do try to avoid spending too much time at the airport, but the award winning lounge is a destination in itself. 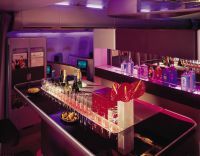 The fact first time visitors are offered a guided tour, or directed to a lounge map, indicates the elaborate offering Virgin provides in its 15,000sq ft of facility. There literally is something for everybody. Some of the guests I spoke with said they actually arrive about three hours early to enjoy all the amenities and specifically travel Virgin because of the offering. Undoubtedly the initial investment of £11 million was expensive, and it must be a loss leader in terms of a P&L sheet, but the airline benefits from creating a dedicated and loyal clientele, a rare thing in the airline industry these days. 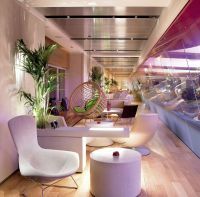 Opened in March 2006 its flagship lounge, which was created by the Virgin Atlantic design team with the help of Softroom, the London-based architectural practice, the interiors were designed to feel like a private members’ club and for regular flyers that is just what it is. 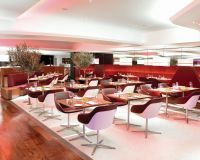 Subtle colours reflecting the Virgin brand are reflected in the stylish selection of seating areas including a viewing area of the apron. Cane globe seats hang from the ceiling of the viewing deck overlooking the apron, a 14-meter bar offers a full range of cocktails, wines, spirits and of course Lanson champagne that flowed. A library provides computer access and a television area has a number of screens with individual headphones and reclining seats. For addicted DJs and in a nod to Virgin’s entertainment heritage there are even mixing decks to spin some tunes, or alternatively take advantage of the Den which incorporates a pool table amongst other games. The whole area has courtesy wi-fi access too. The biggest challenge was selecting what to do. A Grey Goose vodka bar – The Loft – overlooks the lounge and with its cool white minimal interior, stylish black and white imagery would match any Soho establishment. The bartender cares for your every need and having explored my 'taste' preferences, apparently its Umami, he introduced me to a lip-smacking truffle infused martini, so good I had to arrange for a second one to be delivered to the spa area whilst having a manicure. The spa offers familiar treatments in miniature including facials and massages, and there’s a hairdresser for that last minute coiffure. The deli has a fine selection of smoked fish, European hams and Mediterranean styled vegetables with salads. The Brasserie which is open all day offers lunch, afternoon tea, a children’s menu and a menu representing the great national dishes of the UK, Sausage and Mash, Chicken Jalfrezi , Ham Hock and Pea Terrine and Banoffi Pie. If the ubiquitous First/Business Class lounge is there to make you relax before flight, Virgin has completely mastered the art. Virgin Lagos flights leave the UK daily at 22:20 arriving into Lagos at around 05:20 and having enjoyed the Clubhouse offering passengers in Upper Class can more or less immediately settle into a good night’s sleep. The A340-600 offers 45 seats, or to use Virgin’s nomenclature Upper Class Suites, which are private, comfortable and ergonomically well thought out for maximum passenger comfort. Individual spacious seats are separated by panels which delineate your space from your neighbour. Measuring 22 inches wide the curving cocoon-like seats offer completely lie-flat beds which the attendant helpfully demonstrates how to use as it’s a bit of a mystery for the uninitiated. Virgin states once positioned the bed is 6ft 6ins in length, are 33 inches wide and are some of the roomiest Business Class beds in the sky. Sumptuous duvets and soft pillows add to that bedtime experience and within half an hour of boarding passengers can be asleep. For the insomniacs there is of course the option of a welcome drink, followed by a full dinner menu which is an extension of the lounge brasserie and includes fresh minted pea soup, seared salmon or filet steak, a desert selection and a fabulous selection of cheese. An international wine assortment complements the menu and of course liqueurs are offered with the coffee. The cabin is configured in a herringbone style of three columns with each having its own aisle access. A single seat on the left faces the back of the two columns on the right but the clever angles ensure that the two facing aisles on the right deliver privacy to each individual. Upholstered in a rich purple leather and edged with red, the seats are complemented by an ottoman foot stool that is not only convenient for putting your feet up, but practical as it is hollowed out so creating extra space for your travel apparel. It also doubles as a seat for visitors to your Suite. The TV is stowed in the side panel that separates you from your neighbour, and sits on an extendable arm so you can have the screen as near or far as is comfortable for you. The dining table, which is a decent size, prevents the traditional Jenga balancing act as drinks, bread, butter, salt and pepper containers and your meal is delivered. Stowed in the foot end of the seat configuration the table cleverly appears and extends to the seat area for ease and convenience and can be relocated when dinner is over as a drink shelf sits just beneath the TV screen allowing travellers to have space for a drink and snack. A silver, small, but bright reading light sits just above the shelf allowing for private reading during the midnight hour without disturbing your fellow passengers. There is also a power socket for executives needing to work. The bathrooms feature fabulous Cowshed products which are disappointingly absent from the amenity bag. It does include however the overnight necessities of eye mask, facial tissue, pen, toothbrush and paste, earplugs, and socks. More exciting though is the skin soft sleep suit which is a two part cotton trouser and top pyjama set. It’s surprising that the suits don’t have the same message printed on them as their miniature airplane salt and pepper pots each of which features the inscription “pinched from Virgin”. If sleep eludes you the InFlight Entertainment system is excellent. Powered by Panasonic and recently updated on long haul flights, gate to gate entertainment is now possible, no more frustration at losing the last 15 minutes of the movie during descent. Within the system, known as Vera, there are 300 hours of movies, documentaries, TV shows, music and interactive games. The choice includes the latest movies in addition to classics, and a selection of comedy, drama and documentary TV programmes. In addition as expected with Virgin the music offering is unbeatably current. Bearing safety in mind and ensuring passengers can enjoy the full experience Virgin provides noise cancelling headphones which are designed to easily detach in case of an emergency. Not quite up to the standard of Bose or Sennheise they still do a pretty good job. Breakfast is served about an hour out of Lagos but if you sleep through the flight attendant helpfully leaves a smoothie and bottle of water so you’re not starving when you land. The airport is relatively quiet at this time and speaking with locals a morning arrival is the one they recommend. The flights that arrive in the evening (BA) are said to turn Lagos Murtala Mohammed into mayhem and passengers can end up spending three hours waiting for customs, immigration and suitcases. Virgin certainly has the timings right. This also means that on the return the morning flight the airport is fairly calm and queues for check-in whilst bureaucratic – a job creating scheme for five – works smoothly enough with little priority for Upper Class. The departure area is sparse and the executive lounge facility is shared by all the airlines and quaintly named Oasis. It is all basic including the food. The flights depart at 10:05 and after the sparseness of the airport Upper Class and its friendly crew are even more welcome. There is a proper arrival lounge at Heathrow, a real contrast to the Lagos departure. Each way it is about 6½ hrs.